Discussion in 'Site Updates & Announcements' started by darthskellington, Sep 27, 2008. Hasbro will finally be immortalizing Bothans in action figure form. As revealed in the latest issue of Previews, Hasbro will be releasing a Borsk Fey'lya action figure in its Comic Book 2-pack line early next year. 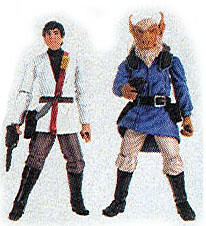 Borsk will come packed with a new Wedge Antilles figure (in New Republic dress uniform). Borsk Fey'lya is a Bothan politician featured prominently throughout Star Wars novels and comics. An occassional thorn in the side of Mon Mothma, and later Leia Organa Solo, Borsk is ultimately loyal to the Republic. He eventually becomes elected head of the New Republic. (I don't recall the exact title, over the years, the title has changed from Supreme Chancellor to Chief of State to President and probably a few others in between to best suit the needs of the people. While Borsk's distinctive long white beard will make it difficult to customize this figure into various generic Bothans, he is a long awaited and welcome addition to everyone's collection. That's awesome. I want one customized with a pink outfit. Super cool! Maybe if I get one, I'll make a mini-size TBS T-shirt for him! As well a a Bothan figure being released by Hasbro, we get to see the Bothan home planet of Bothawui in one of the first episodes of the new Clone Wars animated TV show.